"Kia" redirects here. For other uses, see Kia (disambiguation). 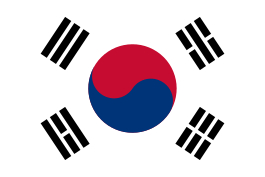 Kia Motor Corporation (Hangul: 기아자동차; Hanja: 起亞自動車, IPA: [ki.a], literally "Kia automobile"; stylized as KIΛ), headquartered in Seoul, is South Korea's second-largest automobile manufacturer, following the Hyundai Motor Company, with sales of over 3.3 million vehicles in 2015. As of December 2015, the Kia Motor Corporation is 33.88% minority owned by the Hyundai Motor Company totaling just over $6 billion USD. Kia Motor Corporation is a minority owner of more than twenty Hyundai subsidiaries ranging from 4.9% up to 45.37% totaling more than $8.3 billion USD. According to Kia Motors, the name "Kia" derives from the Sino-Korean characters ki (起, "to come out") and a (亞, which stands for (East) Asia), it is roughly translated as "arise or come up out of (East) Asia" or "rising out of (East) Asia". As of December 31, 2015, the Hyundai Motor Company owns a 33.88% stake in Kia Motors. Likewise, As of December 31, 2015 Kia Motors is owner in 22 different Hyundai companies. Their ownership percentages range from 4.9% up to 45.37%. The company has built a $1 billion manufacturing plant in the northern Mexican state of Nuevo León, which produces 300,000 cars a year. Details of the factory, built in the city of Pesquería, were revealed in a joint press conference given by Kia Motors CEO Hyoung-Keun Lee and the President of Mexico Enrique Peña Nieto in Mexico City on 28 August 2014. The plant was expected to be completed in the first half of 2016. Hwaseong Plant, Hwaseong production capacity of 600,000 cars per year. 1 2 "Kia History". www.kia.com. Retrieved 2016-07-15. 1 2 3 4 5 "Financial Statements For Kia Motors Corporation (KIMTF)". businessweek.com. Retrieved 2011-04-25. ↑ KIA Motors South Africa Archived September 26, 2006, at the Wayback Machine. ↑ "Kia history". Kia UK. Retrieved 2014-06-18. ↑ "Rising out of Asia". thehyway.com. Archived from the original on December 15, 2009. Retrieved 2010-11-02. ↑ Dackevall, Gunnar, ed. (1988). BilKatalogen 1989 (Swedish edition of German Auto Katalog) (in Swedish). Stockholm, Sweden: PM Press AB. p. 261. 0284-365X. ↑ "Kia Motors Shareholders". Kia Motors. 2016-06-30. Retrieved 2016-07-24. 1 2 "Chief Design Officer Peter Schreyer". Kia.co.nz. Retrieved 2010-04-04. ↑ "2011 Kia Sorento SX". Kia Press Release. 2008-12-09. ↑ "Interview with Peter Schreyer, Chief Design Officer" (Press release). Kia Press. 2010-03-02. ↑ "Kia Celebrates Grand Opening of $1 billion State-of-the-Art Automobile Manufacturing Plant in Georgia". Press release. Kia Motors Manufacturing Georgia. 2010-02-26. Retrieved 2010-04-04. ↑ "Kia Motors' State-of-the-Art U.S. Manufacturing Facility is Featured in a Segment of the History Channel's Hit Series Modern Marvels". MarketWatch. 2010-03-04. Retrieved 2010-04-04. ↑ Siemaszko, Corky (14 August 2014). "Pope Francis rides in Kia Soul during visit to South Korea". NY Daily News. Retrieved 16 August 2014. ↑ Kelly, Mark (14 August 2014). "The Pope Takes a Soul to Seoul". Yahoo! News. Retrieved 16 August 2014. ↑ Park, Si-soo (15 August 2014). "Pope Francis bestows halo on Hyundai-Kia". The Korea Times. Retrieved 16 August 2014. ↑ Klara, Robert (15 August 2014). "Pope Francis Ditches his Mercedes for a Kia In Seoul, the Soul gets a big marketing blessing". Adweek. Retrieved 16 August 2014. ↑ LeBeau, Phil (22 June 2016). "Kia Just Accomplished Something No Automaker Has Done in 27 Years". CNBC. Retrieved 23 June 2016. ↑ "Hyundai Motor Company 2013 annual report" (PDF). Worldwide.hyundai.com. Retrieved 2014-11-02. ↑ "Kia Annual Report by Year". Kia.com. Retrieved 2016-01-06. ↑ Archived January 2, 2013, at the Wayback Machine. ↑ "From the ashes | Motor Trader Magazine | Motor Industry: News – Jobs – Awards". Motortrader.com. 2000-06-26. Retrieved 2011-04-24. ↑ "Kia's Record Breaking Sales Figures". Carpages.co.uk. Retrieved 2011-04-24. ↑ Par Romain Baly, le 23/07/2013 (2013-07-23). "L'Europe sourit à Kia" (in French). Journalauto.com. Retrieved 2016-01-06. ↑ "Automaker Kia plans $1 bn assembly plant in Mexico". Mexico News.Net. 28 August 2014. Retrieved 28 August 2014. ↑ Maric, Paul (2010-03-12). "We Interview Peter Schreyer Head of Design at Kia". Carbodydesign.com. ↑ "Peter Schreyer is new Kia Design Director". Carbodydesign.com. 2006-07-26. ↑ Ihlwan, Moon (2009-05-21). "Kia Motors' Cheap Chic". Business Week. ↑ "Who's Where: Peter Schreyer to head Kia Design". Car Design News. 2006-07-31. 1 2 3 "Interview with Peter Schreyer, Chief Design Officer" (Press release). Kia Press. 2010-03-02. ↑ "Reinventions: How Kia Got Its 'Tiger Nose'". Bloomberg. ↑ Sloane, Alastair (2009-04-25). 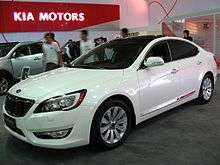 "Kia on the straight and narrow for design of new sedan". New Zealand Herald. ↑ "New Kia president has designs on greatness". The Globe and Mail. Toronto. January 9, 2013. Archived from the original on January 9, 2013. ↑ Giongco, Mark (2014-06-10). "Kia hires Manny Pacquiao as head coach for PBA team". Philippine Daily Inquirer. Retrieved 2014-06-25. ↑ Badua, Snow (2014-08-24). "Kia finally settles on a moniker for PBA team - and it's neither Kamao nor Pride". Spin.ph. Retrieved 2014-08-26. ↑ "Azkals Extend Partnership with Kia's Local Distributor". Top Gear Philippines. 2012-06-25. Retrieved 2012-08-15. 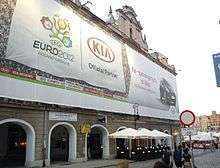 ↑ "Basketball global superstar LeBron James is Kia's luxury ambassador". Top Gear Philippines. 2014-10-16. Retrieved 2014-10-16. ↑ "CHASE BRYANT IS FIRST COUNTRY ARTIST FEATURED IN KIA'S "REDISCOVERED" SERIES". Chase Bryant. 2015-03-09. Retrieved 2015-03-12. ↑ "Kia Motors and DC Entertainment Band Together to Create a Fleet of Justice League-inspired Vehicles for Hunger Relief Effort". DC Comics. 2012-10-03. Retrieved 2012-10-05. ↑ Joseph, Noah (2014-11-24). "Kia Sorento bares its claws for X-Men Special Edition". Autoblog.com. Retrieved 2014-11-25.